Here's a listing of all our tomato tips. 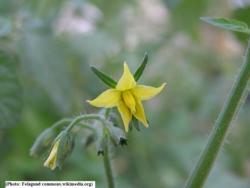 Refer to the UC Pest Site page on tomatoes for more information about caring for tomatoes and the most common problems. In September pinch new blossoms off tomato plants to direct the plant's energy into growing and ripening already formed tomatoes. It takes several weeks to go from blossom to fruit, so the tiny little yellow flowers that are just starting now are unlikely to have time to produce good quality tomatoes. If you have a hornworm, you will know it. You will look at your plant and a good portion of it will be missing, eaten by the hornworm. All that is left are some large black droppings, the remains of your leaves. You may see this first, because they are the same color as the leaf and are hard to see. They are the largest caterpillars you will see in the garden, as long as four inches, with a distinctive horn or thorn on the rear end. They are beautiful, with white striping and little round circles. The amount of damage they do is unbelievable. Hand pick to control or use Bacillus thuringiensis (BT). More information in the UC Pest Note On Tomato Hornworms. It's time to start planning how you will stake your tomatoes. You will want to stake your tomatoes right after you plant your seedlings. Here are the various Tomato Staking Techniques we have tried. If you haven't already, it's time to cut back on watering tomatoes. Tomatoes have far more flavor when the ripening fruit is deprived of water. Don't forget to remove competing weeds from around the garden.